Citation Information: J Clin Invest. 2011;121(9):3505-3516. https://doi.org/10.1172/JCI45913. Osteoclasts are terminally differentiated leukocytes that erode the mineralized bone matrix. Osteoclastogenesis requires costimulatory receptor signaling through adaptors containing immunoreceptor tyrosine-based activation motifs (ITAMs), such as Fc receptor common γ (FcRγ) and DNAX-activating protein of 12 kDa. Identification of these ITAM-containing receptors and their ligands remains a high research priority, since the stimuli for osteoclastogenesis are only partly defined. Osteoclast-associated receptor (OSCAR) was proposed to be a potent FcRγ-associated costimulatory receptor expressed by preosteoclasts in vitro, but OSCAR lacks a cognate ligand and its role in vivo has been unclear. Using samples from mice and patients deficient in various ITAM signaling pathways, we show here that OSCAR costimulates one of the major FcRγ-associated pathways required for osteoclastogenesis in vivo. Furthermore, we found that OSCAR binds to specific motifs within fibrillar collagens in the ECM that become revealed on nonquiescent bone surfaces in which osteoclasts undergo maturation and terminal differentiation in vivo. OSCAR promoted osteoclastogenesis in vivo, and OSCAR binding to its collagen motif led to signaling that increased numbers of osteoclasts in culture. Thus, our results suggest that ITAM-containing receptors can respond to exposed ligands in collagen, leading to the functional differentiation of leukocytes, which provides what we believe to be a new concept for ITAM regulation of cytokine receptors in different tissue microenvironments. OSCAR is a collagen receptor. (A) Binding of human Ig-like receptor Fc fusions to BSA or collagens I–V in a solid-phase binding assay (see Methods). A GpVI Fc-fusion protein (GpVI-Fc) was used as positive control for collagen-binding activity, and human IgG (hIgG) was used as negative control. For a description of the other human Ig-like receptor Fc-fusion negative controls, please see Methods and Supplemental Figure 2A. (B) hOSCAR-Fc, preincubated with murine IgG1 or anti-hOSCAR mAb 11.1CN5, binding to BSA or collagen I–III. Solid-phase assay binding data are represented as mean (n = 3) ± SEM. (C) Collagen I–FITC binds to hOSCAR-expressing RBL-2H3 cells (clone 9). RBL-2H3 cells stably expressing hOSCAR-FLAG (white) and untransfected RBL-2H3 cells (dark gray) were stained with FITC-conjugated anti-FLAG mAb and analyzed by flow cytometry. 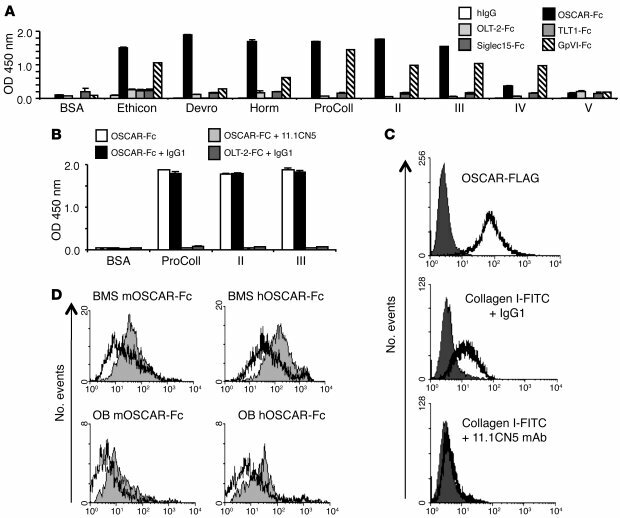 Collagen I–FITC binding to hOSCAR-FLAG transfected RBL-2H3 cells compared with that of untransfected-RBL-2H3 cells. Preincubation with mouse anti-hOSCAR mAb 11.1CN5, but not a mouse IgG1 isotype control mAb, blocks collagen I–FITC binding to hOSCAR-FLAG expressing RBL-2H3 cells. (D) An OSCAR ligand is associated with OBs and stromal cells. Murine OSCAR-Fc (mOSCAR-Fc) and hOSCAR-Fc binding to collagenase-treated (white) or untreated (gray) BMSs or OBs.